I bought myself an expensive bracelet on Black Friday. Yesterday, Friday afternoon, I went with a group of the blended fam to Dahlonega, GA to see the lighting of their downtown square. Dahlonega is the town in Georgia where the first US gold rush occurred. Cute little North Georgia mountain town. I drove the jeep with Erik, his girlfriend Fenly and Linda, Erik's sister-in-law. We called ourselves the fun car. After the lighting, we negotiated a rendezvous 25 miles away at a Mexican restaurant on the way home. I got in our car and started feeling terrible. About 10 minutes in, I said, "I need to pull over for a second." I hung out the window, barf flying into my hair and all over my shirt. I was freezing cold, and crampy, and crying. I asked if they still thought this was the fun car. They laughed. They got me into the ER, and the nurses handed me a barf bag. I sat in the ER for a good 30 minutes, puking loudly. Mom encouraged me to make as much noise as possible to establish my priority for a room. At some point, a nurse took some blood and gave me a Zofran. 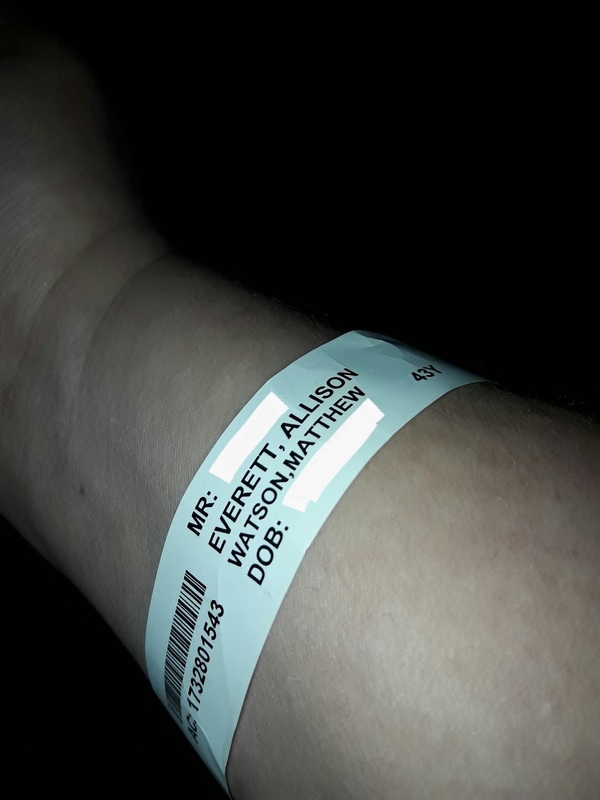 While all this is going down, the family finishes dinner, comes to check on me, and Erik and Fenly take the jeep home, as Matt has been summoned to come to the ER. Finally, they take me back to a room, and I urge Mom and Matt to stay far, far away. They put me in a room where BET is playing. I peel off my shirt and throw on a gown. I am freezing and chattering. They couldn't get my temp to register - too low. Which is what happens when you spend an hour hanging out of a moving car puking. Finally, a doctor comes in and asks me some questions. He promises me a heated blanket. He thinks it's vertigo (the absence of diarrhea rules out noro and food poisoning). Says I'm going to need IV fluids, and they're going to get my labs back shortly. The nurse comes in and starts my IV, which is fluids, phenergan and ativan. I correctly guess her accent as French Canadian - she's from Quebec. I tell her in French about my trip to Montreal. I assume it was in French. She asks me where I learned to speak it, and seems impressed that even under duress, I can manage a narrative in a second language. The registrar comes back and wants my insurance and financial info, and I tell her my Mom and Matt have my stuff, so she brings them in. She explains my financial obligation, and I hand her a credit card. I sign the slip with what amounts to an X, and we're good to go with Money Lady. I try to explain what happened to Mom and Matt, but I keep stopping because the ativan makes me tired. Canadian nurse comes in and tells my family that I may be sick, but my French is in good shape. New nurse comes in and says he's going to need a urine sample. Matt helps me up and I end up giving a sample of extremely dark urine. Dehydration, which may have triggered the vertigo, or not. I still don't know. I finish up the IV, they prep me to leave and give me a few scrips. I sleep most of the way home, and by the time we get there, it's around 1:30 AM. I shower, throw on some pajamas, and crawl into bed with Mom and the pugs. We decide being near the nurse is a good "just in case" move. I don't remember anything past Mom turning on her white noise. This morning, I learn that Erik washed the jeep before returning it. Shortly after Mom takes Laura, Tom and Henry we get a call from Jorg and Linda to see how I am, and they want to stop by to say good bye before we leave. So, as horrifyingly gross and awful as it all was...how lucky am I to be surrounded in love and support? For now, I'm sore from several hours of heaving bile, and holding my body out of a moving vehicle. I am stiff, weak, and a little groggy. I'll be heading to bed in a minute. But the short of it is - I am glad to have survived it. Sounds awful. But yeah, your worst day surrounded by people who love you is always going to be better than your best day alone. Hope your urine resumes its normal golden tone soon!